Leading off today: There was a suspicion by some that Dennie Miles' retirement last summer after 35 years as the athletic director and 42 as the baseball coach at Wellsville might not last long. That was proven be correct as Avoca kicked off its season with a 3-2 win over Canisteo on Saturday in Miles' debut as the coach. Nate O'Brochta (seven strikeouts in four innings) and Noah Hughes combined to fan 12 batters in the win. "My wife said after six months of me being home, 'You've got to go find something to do,'" Miles said. "But the superintendent of Avoca was very much a part of me coming over. He would not be denied. And this was a good opportunity for me to maybe start over in a lot of ways. "When I retired at Wellsville, I felt like Joe Girardi where I had used up my shelf life. But these guys haven't heard all the old Dennie Miles stories. I'm having a lot of fun with this, and small towns like Avoca -- they love their sports, and I'm enjoying it." Miles won 718 baseball games and 12 Section 5 championships at Wellsville for the No. 2 total in NYSPHSAA history to the 777 by Craig Phillips entering his 46th season at Fort Plain. That was in addition to 209 wins in boys soccer and another 89 during a brief stint coaching boys basketball. More Saturday action: Andra Savage posted five goals and three assists to go over 300 points for her career as Palmyra-Macedon defeated Lancaster 20-12 in girls lacrosse. Jamie Walker paced the Red Raiders with nine goals and two assists. Split decision: It will be left to the New York State Public High School Athletic Association Executive Committee to determine who will host the 2020-22 girls soccer championship weekends. Split decisions are fairly uncommon, but the girls soccer committee voted last week to keep the event in Cortland, where it's been a fixture since 2006, while the NYSPHSAA office staff supported a bid by Section 5 schools. Monroe-Woodbury also submitted a bid. I've thought for awhile that soccer bids involving SUNY Cortland facilities could be problematic because the college's strong sports programs rightfully have to take priority over high school events, which is why late venue changes were made the last two years to accommodate NCAA soccer playoffs. The Cortland bid package, which includes the use of fields at Tompkins Cortland CC plus Homer and Cortland high schools, also acknowledges potential schedule conflicts with the SUNY school's football rivalry with Ithaca College in 2020 and '22 which would affect hotel availability. The Section 5 bid, which came in less costly, calls for games to be split between Eastridge High in Irondequoit and the two Webster public high schools, with East Rochester serving as a backup venue. The next NYSPHSAA Executive Committee meeting is scheduled for May 2 in Saratoga Springs. Football developments: Eight-man football has picked up one team and lost another. Longtime Section 3 rivals Westmoreland and Oriskany will join forces at the varsity level next fall. Oriskany played in an eight-man division and finished 5-2 with 11 seniors on its 20-man roster last fall. Westmoreland's squad went 1-7 in Class D competition. "We were at a point where we couldn't field a team, and we wanted to give kids the opportunity to play football," Oriskany AD Tom Meiss said. "It's good for kids to have that opportunity -- both districts recognize that -- and these kids have grown up playing with each other, so it should be a good situation for everybody." Meanwhile, Elmira Heights Edison is making the move to eight-man football after receiving school board approval on Wednesday. Edison struggled at times to meet the 16-player minimum last fall and finished with a 2-7 record. "We went into last season with 20 and we'd be looking to go into next season with the low 20s," said AD Mike Bennett, who coached the team from 2013-17. "We were struggling week to week to figure out if we were going to have enough players after injuries and school policies and whatnot. Many times it was Wednesday or Thursday before we'd get the clearance from doctors and things like that to know if we'd have enough. It was a tough game for the coaches and the kids to fight last year." Edison's 11-man football team has not had a winning season since a 5-4 mark in 2007. Looking for two helpers: I did an email blast two weeks ago to reporters and a handful of other frequent helpers in search of individuals who could assist us on weekly baseball rankings this spring. That yielded volunteers who'll be assisting us in nine of the 11 sections, but we're still looking for help out of Sections 1 and 9. If you can assist by supplying weekly updates on the top teams in each class from those sections, send me an email at jmoriello@yahoo.com. Extra points: Ben Scaffidi resigned as boys basketball coach at Starpoint after compiling a 55-91 record in seven seasons. I wrote about the Wilmette (Ill.) Loyola Academy boys lacrosse team last year after its swing through the Upstate New York stomping grounds of coach Rob Snyder to play three demanding games in three days. FYI, the Ramblers' New York tour this spring will consist of the trifecta of Chaminade, St. Anthony's and Garden City -- merely three of the four best teams on Long Island -- from April 23-25. 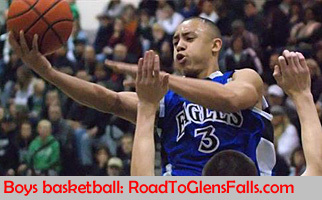 Glens Falls senior Joseph Girard III will compete in the high school 3-point competition in Minneapolis on Friday at the NCAA Men's Basketball Final Four.